Hank Palmer (Robert Downey Jr) is a talented but unscrupulous lawyer forced to return home to a small Indiana town when his mother dies. His return re-opens old wounds with his father (Robert Duvall), the local judge. Just when Hank is set to leave for good, an alleged hit and run sees his father arrested for manslaughter and Hank is forced to choose between old grudges or helping his father out. Well that all sounds like about one hundred different courtroom dramas we have all seen before. In cinemas, or more regularly on television every second weekday afternoon. The truth is that in terms of story and to a large extent in its screenplay The Judge is a remarkably average and by-the-numbers kind of small town drama. While most viewers will not necessarily predict each plot beat as it occurs, it seems doubtful that any one of them will come as a surprise. It is interesting that about 15 years ago this would have been every second feature film made by a Hollywood studio. The last decade or so has pushed the middle ground out of American cinema. We used to drown in these sorts of middle-budget traditional dramas, filled with respectable actors and both shot and edited in a slick, clear manner. The last decade has seen franchise pictures grow enormously in popularity, while to a large extent the mid-range drama has slipped over into cable television and streaming providers. The comparative paucity of these sorts of film dramas in recent years might indicate why The Judge felt as entertaining as it did. That, and two strong lead performances by Robert Downey Jr and Robert Duvall. 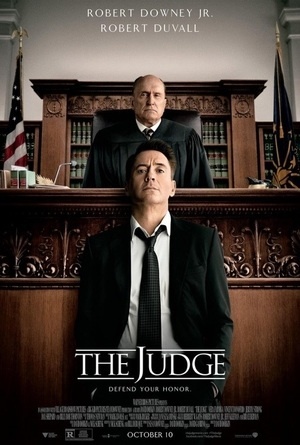 In many respects Downey has selected a pretty safe role in The Judge. Hank is smart, arrogant and funny, and that places him somewhere fairly close along the spectrum of characters to the one he plays in Marvel's Iron Man movies. The truth is that Hank is actually a distinctly different person, and Downey plays him in a different manner, but it does remain close enough that a lot of viewers could be excused for thinking the actor is failing to stretch himself here. To an extent he plays straight man to Duvall's superbly realised Judge Joseph Palmer. When we first meet him he is grieving his dead wife of 50 years. He is prickly. He is grumpy. He considers himself morally and ethically superior to everyone around him. There is an unspoken wound in his and Hank's relationship that provides the film with much of its carefully doled-out conflict and back story. He is also a man who is dying, having secretly undertaken chemotherapy for some time and whose growing memory lapses - a side-effect of the medication - have led to him running over and killing a man without having any memory of doing the deed. Duvall received an Oscar nomination for his performance here. It would be easy to assume he received it for bravely showing a man whose body is failing him, and for suffering the indignity of appearing of screen in various states of physical and emotional disrepair. To be honest the overall performance deserves the acclaim it received. Joseph is a complex, multi-layered character whose facets get revealed, onion-like, as the film goes on. He remains one of America's great living actors - The Judge acts as a reminder of that. The supporting performances are generally very strong, including Vincent D'Onofrio is Hank's slightly resentful older brother, the always-excellent Vera Farmiga as Hank's former home town sweetheart, and a slightly under-used Billy Bob Thornton as the lawyer prosecuting the state's case against Joseph. There is a nice visual texture to the film, with high contrasts and desaturated colour thanks to cinematographer and regular Spielberg collaborator Janusz Kaminski. The performances seem well directed by David Dobkin, making quite a break in his career here; his earlier films include Shanghai Knights and Wedding Crashers. In the end the film is fairly predictable, and it certainly goes on a solid five minutes longer than it needs to, but there is something comforting about it. It brings an aroma of mainstream cinema from back in the early 1990s, back at a time when I really started focusing upon and appreciating cinema. Good performances, a pleasant nostalgia trip; sometimes that really is all I need to be entertained. Doctor Who: "A Desperate Venture"
Crusade: "The Well of Forever"
Star Trek: Deep Space Nine: "Sons of Mogh"
Star Trek: Deep Space Nine: "Return to Grace"
Doctor Who: "A Race Against Death"
Babylon 5: "A Call to Arms"
Star Trek: Deep Space Nine: "Crossfire"
Star Trek: Deep Space Nine: "Paradise Lost"
Babylon 5: "The River of Souls"
The Flash: "Fastest Man Alive"
Star Trek: Deep Space Nine: "Homefront"
Star Trek: Deep Space Nine: "Our Man Bashir"